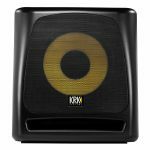 Notes: The 10s powered studio subwoofer builds upon KRK's legacy for sonic accuracy and performance. The custom-voiced, glass-aramid woofer delivers tight, defined bass, while the Class-D powered Amplifier dramatically increases transient response, control and punch, allowing you to properly engineer the low-frequency portion of the mix. The four-position selectable crossover makes it easy to adjust the subwoofer setting to your existing monitors. Pairing the 10s with KRK or another studio monitors delivers an optimized listening and mixing experience with extended low end, while the exclusive bypass-control feature provides full range audio to the monitors if needed, without switching off the subwoofer. KRK's 10s subwoofer doesn't just deliver precise bass and a rich feature set: it's the next dimension in subwoofer performance. Notes: KRK's ROKIT 4 G3 powered studio monitor offers professional performance and accuracy for recording, mixing, mastering and playback. The system consists of a 1" soft dome tweeter and 4" glass-Aramid composite woofer. It delivers high frequencies up to 35kHz, vocal clarity and extended bass response. Notes: KRK Systems is one of the world's most respected manufacturers of studio reference monitors. In their state of the art design facility, KRK engineers create products that deliver natural and balanced spectral response with low distortion and superior imaging. KRK Studio Monitors have been the professional's choice of recording engineers and artists for mixing and mastering hit records around the globe, as they need to hear every nuance of the audio being reproduced. KRK Rokit Generation 3 monitors continue in this design philosophy, so regardless of your musical style, genre, or particular mixing needs, KRK Rokits deliver. Notes: The new 5" KRK ROKIT RP5 Generation 4 ("G4") bi-amp professional monitor takes music and sound creativity to a whole new industry-level. DSP-driven room tuning with 25 visual Graphic EQ settings on an LCD, combined with the included KRK App help minimize and correct problems in your acoustic environment. Matching drivers made with Kevlar ensures the same sonic integrity on every single frequency, minimizes listening-fatigue, and offers an incredibly balanced listening experience. A scientifically designed high-quality speaker enclosure and newly-designed front-firing port offer exceptional low-end extension, punch and flexible room-positioning. High density Iso-foam pads decouple the speaker from the surface for improved clarity while fluid mechanics fully tuned to the entire system result in a deep and dynamic listening "sweet-spot" with incredible imaging and 3D soundstage. A new custom designed efficient class D power amp reduces operating temperatures to retain better audio integrity while a built-in Brickwall limiter automatically engages at maximum amp-level to maintain a balanced sound, protect the system, and offer better and wider dynamics. Although truly affordable, price isn't even in the ROKIT conversation-professionals choose ROKITs for their time-tested and reliable results. The new ROKIT Generation 4 Line actually is ROKIT Science. KRK's Rokit 6 G3 (Generation 3) powered studio monitors offer professional performance and accuracy for recording, mixing, mastering and playback. The system consists of a 1" soft dome tweeter and 6" glass-Aramid composite woofer. It delivers high frequencies up to 35kHz, vocal clarity and extended bass response. The proprietary bi-amped, class A/B amplifier grants SPL up to 107dB. The Rokit waveguide is designed to ensure detailed imaging in the listening position. The front-firing bass port reduces boundary coupling to allow flexible positioning in the room while the engineered surface reduces diffraction distortion. Multiple input connections ensure the ROKIT 6 G3 will easily integrate in any system configuration. Notes: The new 7" KRK ROKIT RP7 Generation 4 ("G4") bi-amp professional monitor takes music and sound creativity to a whole new industry-level. DSP-driven room tuning with 25 visual Graphic EQ settings on an LCD, combined with the included KRK App help minimize and correct problems in your acoustic environment. Matching drivers made with Kevlar ensures the same sonic integrity on every single frequency, minimizes listening-fatigue, and offers an incredibly balanced listening experience. B-STOCK: Product has marks, and in a different box. Notes: The new 8" KRK ROKIT RP8 Generation 4 ("G4") bi-amp professional monitor takes music and sound creativity to a whole new industry-level. DSP-driven room tuning with 25 visual Graphic EQ settings on an LCD, combined with the included KRK App help minimize and correct problems in your acoustic environment. Matching drivers made with Kevlar ensures the same sonic integrity on every single frequency, minimizes listening-fatigue, and offers an incredibly balanced listening experience. Notes: KRK Systems V Series 4 nearfield studio monitors are specifically designed for audio production applications where accurate reproduction is critical. KRK worked with hundreds of pro engineers/producers/mixers to develop these ground-breaking monitors. Recording and broadcast studios as well as sound design and audio production houses will benefit from adding the V Series 4 as the go to monitor of choice. V-Series 4 includes 49 user selectable EQ settings to ensure proper setup for room acoustics and placement anomalies as well as taste and individual preference. The KRK design team has painstakingly modelled and analysed hundreds of monitor placement and room acoustic situations to ensure that KRK delivers the most useful tools with minimal adjustments. 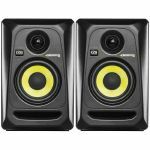 Notes: KRK Systems V Series 6 nearfield studio monitors are specifically designed for audio production applications where accurate reproduction is critical. KRK worked with hundreds of pro engineers/producers/mixers to develop these ground-breaking monitors. Recording and broadcast studios as well as sound design and audio production houses will benefit from adding the V Series 4 as the go to monitor of choice. V-Series 6 includes 49 user selectable EQ settings to ensure proper setup for room acoustics and placement anomalies as well as taste and individual preference. The KRK design team has painstakingly modelled and analysed hundreds of monitor placement and room acoustic situations to ensure that KRK delivers the most useful tools with minimal adjustments. 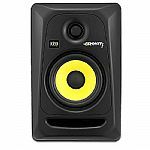 Notes: KRK Systems V Series 8 nearfield studio monitors are specifically designed for audio production applications where accurate reproduction is critical. KRK worked with hundreds of pro engineers/producers/mixers to develop these ground-breaking monitors. Recording and broadcast studios as well as sound design and audio production houses will benefit from adding the V Series 8 as the go to monitor of choice. V-Series 8 includes 49 user selectable EQ settings to ensure proper setup for room acoustics and placement anomalies as well as taste and individual preference. The KRK design team has painstakingly modelled and analysed hundreds of monitor placement and room acoustic situations to ensure that KRK delivers the most useful tools with minimal adjustments. 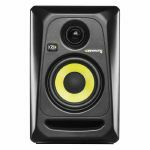 KRK Systems V Series 8 nearfield studio monitors are specifically designed for audio production applications where accurate reproduction is critical. KRK worked with hundreds of pro engineers/producers/mixers to develop these ground-breaking monitors. Recording and broadcast studios as well as sound design and audio production houses will benefit from adding the V Series 8 as the go to monitor of choice.